In the the modern dictionary for ‘Organization Management’, you will get a variety of answers. For example; “Organizationa Management is the process of organizing, planning, leading and controlling resources within an entity with the overall aim of achieving its objectives. The organizational management of a business needs to be able to make decisions and resolve issues in order to be both effective and beneficial”. Another frequently used definition is; “Organizational management is a common management style for modern small businesses. 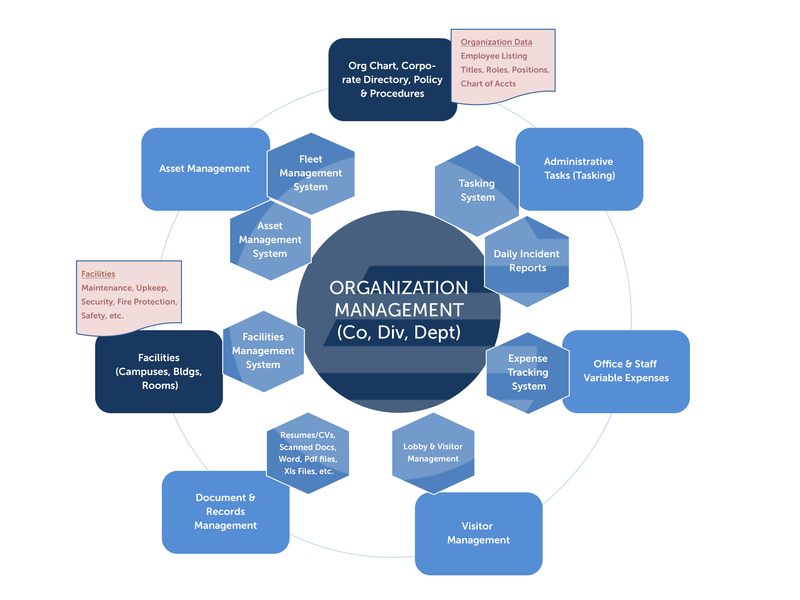 The organizational method allows managers to break down the entire operation of a department into several phases. Dividing operational functions into sections allows management to obtain a clear picture of what the goals of a department are and how to implement the goals most effectively. It also allows managers to respond rapidly to factors that affect the internal or external expectations of company”. But these definitions are ‘Academic’ and don’t really solve the day-to-day management of the ‘Organization Clutter’. We have given a slight twist to the term ‘Organization Management’ to focus more on the ‘Functioning’ of the Organization. For example, to make the ‘Operational Functions’ of the Organization to work in harmony, important information has to be available. It starts with the Organization Chart (Who reports to whom and what are their business titles, roles and functions). Everyone in the Organization must know the Organization Chart and it should be available easily.Corporate Directory, Policy and Procedures and other similar information has to be part of the ‘Daily Routine’ for an Organization to operate smoothly – especially when Employee turnover is high. These Applications have been carefully designed to help Small and Medium sized businesses (even Large Enterprises), streamline the daily non-revenue generating work-load that usually interferes with productivity as well as creates lots of paper-work and clutter in the business process. Try the Apps and judge for yourself. Your Organization will run smoother and efficiently – so that you can focus on generating revenue and profitability.